Worried about the first Facebook usage decline as reported by Edison Research? Of course you are—as a marketer, you pay attention to major Facebook shifts including Facebook’s organic reach decline and the impact of Mark Zuckerberg’s announcements earlier this year. Facebook is one of the top global marketing-media-technology companies known as FAANG (Facebook, Amazon, Apple, NetFlix and Google.) Beyond their massive market share and business clout, their offerings are so much a part of our lives that we can’t imagine being without them. As a result, these 5 companies often signal trends and shifts in the macro-environment. This includes how we gather information, think and relate to other people. In turn, this shapes our media consumption and buying behavior. In the context of other media and trust shifts Edison Research’s Facebook findings require marketers to reassess their 2018 plans and beyond. This includes content marketing, social media and thought leadership strategies. To help you, this article will examine why Facebook usage declined and what other important trends are changing the media landscape. Further, it’ll explain the implications for your marketing and show you how to adapt to grow your business. 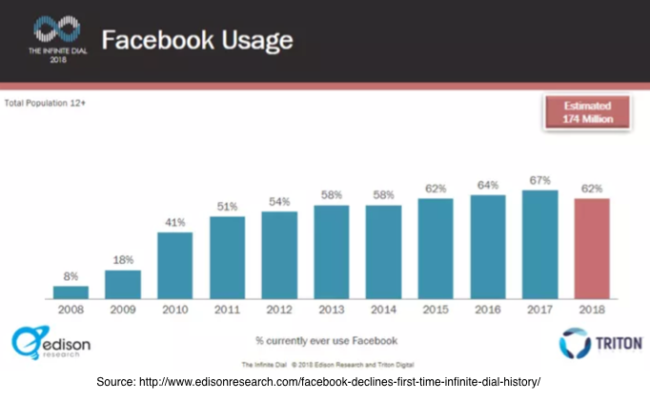 In contrast to consistent growth over the past 10 years, the percentage of US users aged 12+ currently reporting that they “ever use” Facebook fell 5 percentage points to 62% based on Edison Research and Triton Digital’s tracking. Further this usage decline is specific to Facebook; other social media platforms show robust growth. Instagram, owned by Facebook, is expected to grow 13.1% in 2018 to 104.7 million users. Regardless of usage declines, Facebook remains the most-used social media network. The decline of Facebook’s young age segments was predictable. The network initially grew as a teen communication channel away from adults’ prying eyes. US Facebook users 11 and under will decline by 9.3%. Facebook’s policy requires users to be 13+ to join. US Facebook users ages 12 to 17 will decline by 5.6%. For the first time less than 50% of US Internet teens 12 to 17 will use Facebook via any device at least once per month in 2018. US Facebook users 18 to 24 will decline by 5.8%. In 2018 Facebook US user numbers will edge up less than 1% from 2017 to 169.5 million. Due the size of Facebook’s user base this is still a large increase in user numbers. While empowering people to take action, social media has also tarnished our trust in government, business and media. In the process our ability to discern the truth has blurred. Fake news has become a global concern. The ability of non-Americans to use Facebook to place ads and share stories in the 2016 US election was part of the Congressional hearings. This makes the public feel that Facebook can’t safeguard their privacy and personal information. 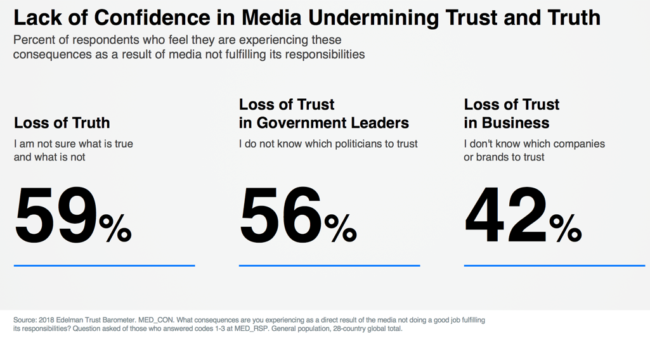 As a result, trust in media entities’ ability to source real news has eroded according to Edelman’s 2018 Trust Barometer. 66% of consumers believe that media entities focus on growing large platforms. 65% of consumers believe that media entities sacrifice accuracy in order to break news quickly. Michael Wolff’s White House tell-all book, Fire and Fury, exemplifies this trend. 59% % of consumers believe that media entities are more concerned with an ideology rather than informing the public. 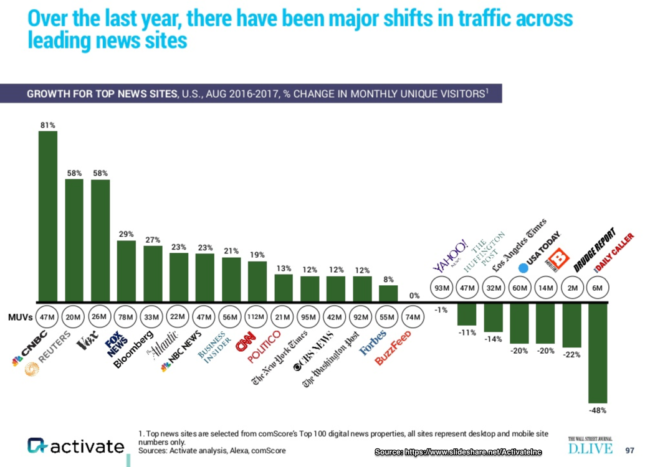 Further, high profile digital media entities like BuzzFeed have experienced flat or declining traffic. As a result, Mashable sold itself to Ziff Davis and Vox shed 5% of its staff (Fast Company). The lackluster performance of these once digital darlings signals that marketers must change how they distribute content and advertise on media. 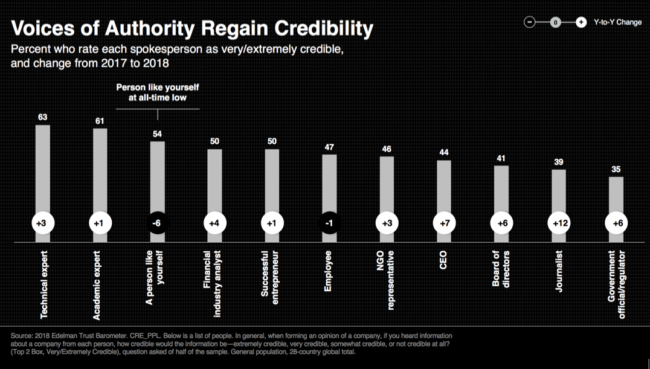 For the first time in 18 years, Edelman’s 2018 Trust Barometer revealed a 6 percentage point decline in trust in “people-like-me” to 54%! This should force you to reassess your 2018 plans.By contrast, here’s what trust looked like in 2017. “People-I-Know” trust is at the heart of Facebook and other social media platforms. Their attraction for marketers is fading. 48% responded social media is media. 65% receive news through social media, feeds, search or news applications. Further, social media contains ads. 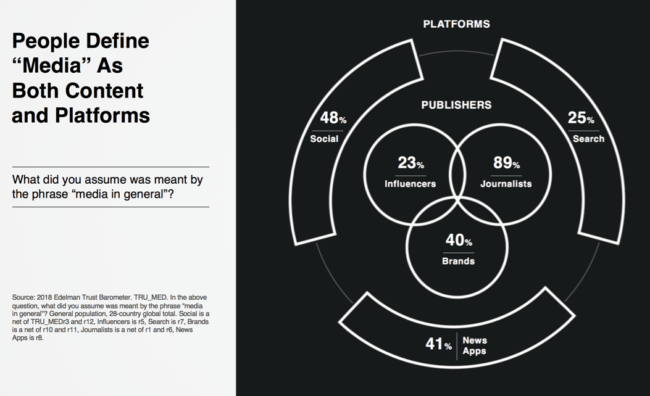 41% responded news apps are media. While the distribution method is different the source remains the same. 40% responded brands are media. Consumers know that you’re behind your content. 25% responded search is media. Used across devices, they know search is ad-supported. 23% responded influencers are media. Your prospects and customers are intelligent. 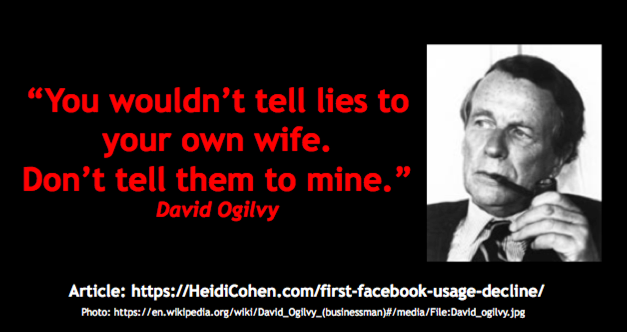 (Hat tip: David Ogilvy) David Ogilvy Quote: Don’t tell my wife lies. As part of this shifting landscape people have started feeling increasingly empowered. It’s best exemplified by the #MeToo movement that’s brought down powerful celebrities and media figures. After the Parkland High School shooting, this trend has extended to students who are mobilizing the #NeverAgain movement against gun ownership. There’s increased awareness of the very real problems and addiction to smartphones and social media entities. Controlling about $2 billion in Apple stock, the California State Teachers’ Retirement System and Jana Partners are publically pressuring the company to take a stronger stance on the mental health effects of excessive smartphone use. 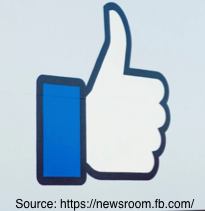 A number of high profile technology developers including Justin Rosenstein who created Facebook’s “Like” button are leading a movement against this manipulated attention-based market. 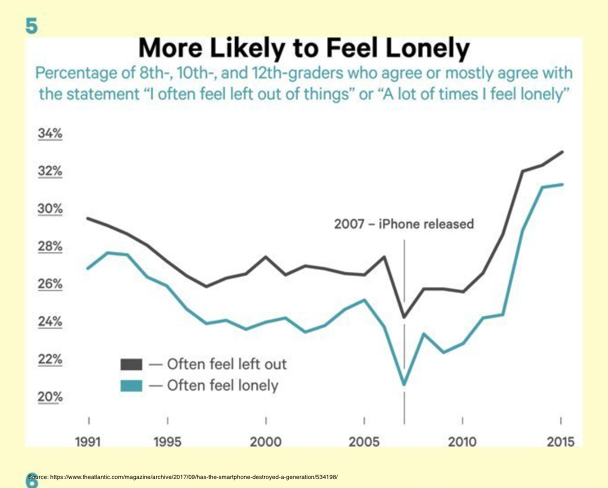 iGen author Jean M. Twenge, who teaches at San Diego State University, spotlights how the smartphone is keeping a generation of students from developing normal teenage behavior. FAANG is a stock market abbreviation for the top tech companies. 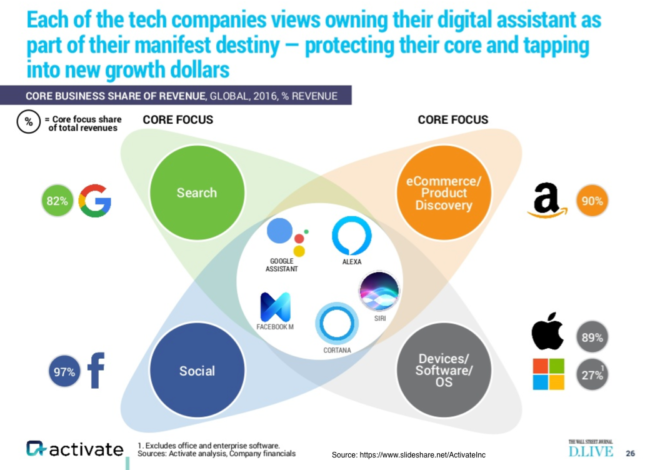 They include Facebook, Apple, Amazon, NetFlix and Google. Addressable audience. While Facebook uses email to get users to return to its site, it lacks the physical address and payment information that Amazon and NetFlix have. Nor does it benefit from physical smartphone ownership like Apple and Google and their related ecosystems. Search. Despite Facebook’s depth of personal data related to location, events and products, it’s not searchable. 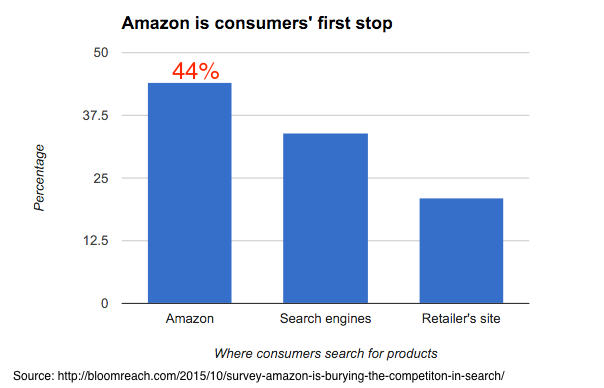 Google Search and YouTube are the top 2 search engines while Amazon is the first stop for purchase research. Google, Apple and Amazon offer voice-activated home assistants and products. Video usage. YouTube out distances Facebook for social media video usage. Additionally YouTube is the hot platform for new music. By contrast, Facebook video is fleeting. For streamed video, NetFlix leads followed by Amazon. Ratings and reviews. Amazon is the granddaddy of ratings and reviews. Google has ratings and reviews (despite trouble with Yelp rankings). While users talk about products on Facebook, there’s no equivalent product data. Despite recent declines and related trends, don’t rush to abandon your Facebook marketing plans. Don’t leave Facebook Marketing on autopilot. Facebook is a dynamic marketplace. Use organic and paid Facebook Marketing for distribution based on your most recent results. Add other media entities to reach teens. Test lots of marketing options on Facebook and other media platforms. To accomplish this, you need the ability to associate your tests with customer acquisition and purchase performance. Include YouTube in your video plans. 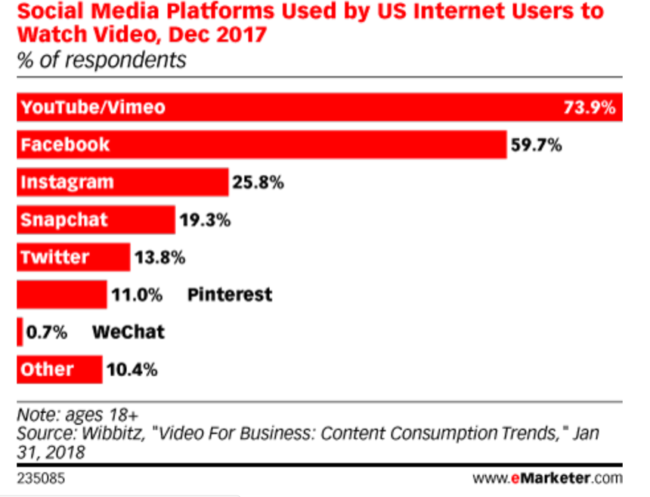 While Facebook video options continue to expand including those available on Instagram, incorporate YouTube into your video strategy. Optimize search for longer-term marketing visibility. Even major Facebook advertisers do this since Facebook only provides short-term amplification and distribution. Add mobile and voice search as well. Follow an integrated customer lifecycle approach. Examine your audience over their full purchase cycle beyond their initial purchase. 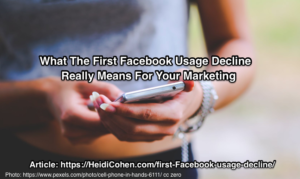 Use the news of this first Facebook usage decline as a wakeup call to reassess your marketing plans. You can no longer leave your social media, content marketing, search or influencer marketing on autopilot. As you assess your marketing determine what to test. Fill your marketing plan’s holes where Facebook lacks opportunities such as search. Start with the metrics information you have to determine which strategies and approaches still yield a positive return and what needs to be modified. Where possible get additional tracking from your finance and/or analytics department to supplement your marketing data. Going forward, determine how to build tracking and metrics into your marketing including Facebook before you start your program. Even better: figure out how to use this opportunity to deepen your audience and customer relationships by being transparent. Take a deep breath because you can handle these Facebook and media changes. Tags Activate, David Ogilvy, Edelman Trust Barometer, Edison Research, eMarketer, Facebook. Bookmark the permalink.